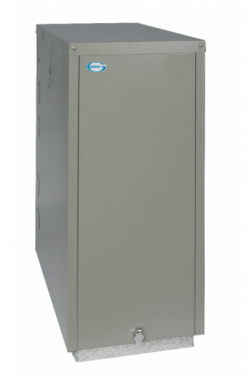 The Vortex Blue External 21kW Combi is an oil boiler which has been designed and manufactured by Grant. This is a floor standing unit which uses condensing technology to deliver a highly reliable and efficient performance. As a Combi boiler it is ideal for for smaller properties as it does not require an external water tank or cylinder; everything is wrapped up in one cost effective unit. It is an external boiler so you don’t need to take up space in your home. This boiler has an efficiency rating of 90.8% making it an A rated unit. It has an output rating of 21kW making it perfect for the smaller homes with only one bathroom and not such a high demand for heating or hot water. Other notable features include the award winning Vortex condensing heat exchanger, the market leading Riello Blue Flame burner, 24 litre expansion vessel, neon diagnostic indicators and a factory fitted internal condensate trap which can be sited externally. In addition, the boiler also features a factory fitted multi directional flue and high quality powder coated external casing. This boiler has built in frost protection to protect your boiler in the cold winter months when you need it most as well as both a mains isolating switch and a test switch. This boiler features a large heat exchanger which due to the low water content and larger surface area vastly increases the hot water performance. The low system pressure cut off switch enables it to protect itself in the unlikely event of system water loss. Two electronic temperature controls help the boiler to operate in condensing mode on central heating whilst maintaining instant hot water production. This boiler is also available in outputs of 26kW and 36 kW for larger homes. It includes a 2 year guarantee so you can be sure the boiler will not let you down.